A few years ago, I carved a snail slithering up rotting fungi out of a piece of lemonwood genero (Calycophyllum multiflorum). The techniques used were not what you'd call traditional carving, but more of an exercise using a collection of power tools, small chisels and scrapers, followed by the application of different stains and dyes. Lemonwood carves a little like boxwood, but is not quite as hard. 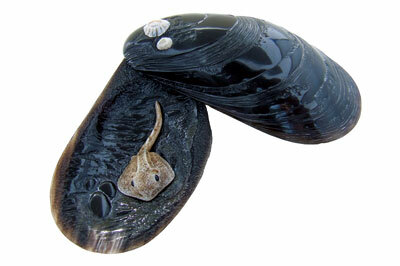 For some while I had an idea to carve a mussel from buffalo horn, which I hoped to have opening to show some hidden surprises in the form of sea creatures. I wondered whether the same techniques and textures could be achieved but on a different material. 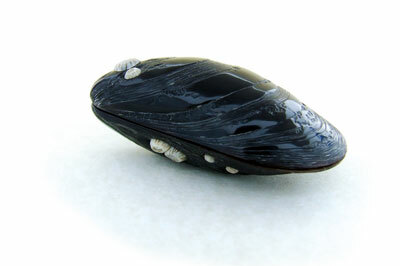 I decided on black buffalo horn for the main body of the mussel, so I picked a nice evenly figured piece, being careful with the central section. Sometimes there is considerable colour variation in this part of the horn, often shown as a milky white striping. I was initially trying to avoid this variation but once I'd got into the carving of the shell, I found it was still there. It was then I realised that the difference in colour made the piece look more realistic - more luck than judgement. Initial shaping was done by making two identical rectangle blocks out of buffalo horn. On each of these, I placed a small cardboard template that I had made in the shape of a mussel shell. After a quick scribe round, it was on to the bandsaw to get the basic mussel shape. The next part was to get each piece of horn extremely smooth on the sides which were going to close together. The stingray and crab were carved from hippopotamus tusk - an extremely hard material, which when used at this scale, requires specialist tools. This is where small scrapers do all of the work. 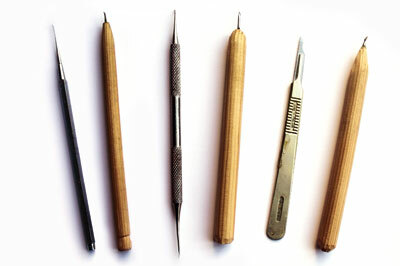 I make these myself from small drill bits and dental picks - each tool is designed and shaped to cut in a particular way, depending on the task in hand. Also when working at this small a scale, a pair of magnifying goggles or a magnifying light is a must. I began work on the outside. Initial shaping was done with small chisels - I tend to use dockyard chisels and a few tools made by myself, mostly from dental scrapers and picks. 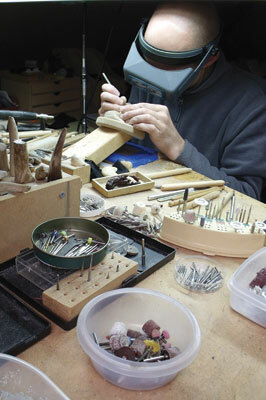 I quickly learnt what type of texture each tool could produce and adopted this method throughout the carving. On the outside of the carving you can see small, layered cuts going round the mussel - these were achieved with a small V-tool. With the texturing complete, I polished it with a small cotton mop with some liquid abrasive, again using power but very gently. on the various horns than can be carved. To finish, I decided to place a few barnacles to contrast with the black horn, carved using small scrapers, lightly stained and pinned in place. For the inside, I wanted to create a seabed with different textured areas and have some smooth pebbles for contrast. I used similar techniques on the inside as with the outside, and also carved different areas using extremely small tools to create subtle differences. I finished by giving the pebbles a high polish to get the contrast I required. Once the two creatures were carved, I moved on to staining. Because the material is so dense, I stippled the surface on the stingray and crab with a very sharp needle mounted on a piece of wooden dowel. This created a key to help take the colour. Amongst the stains used was potassium permanganate, which gives a beautiful rich brown colour. Different coloured Dylon fabric dyes were also applied, and a small quantity of ink. 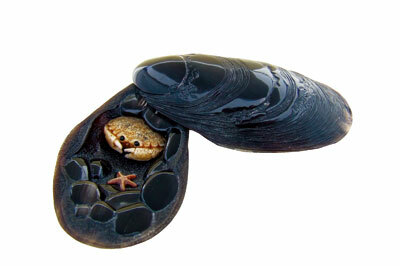 Once the staining was complete, the creatures had to be carefully inlayed and pinned into the mussel shell. Both proved to be difficult as creating a perfect fit takes time and patience. The final job was to insert a concealed screw so the mussel could open and close. The horn was drilled to accommodate this and then disguised with one of the inlayed barnacles. A tiny steel locking pin was also added so the mussel only opens one way and stops in a certain position.